There’s been quite a few attempts at creating a physical game controller for the iPhone. The most successful of which has probably been the ThinkGeek iCade. Despite a few other promising starts, it seems the main hurdle has been Apple allowing unfettered access between said game controllers and the iOS devices themselves. As a result, most game controllers have relied on emulating a Bluetooth keyboard to interface with the iPhone or iPad. While it works well enough for digital controls such as the iCade, full analog stick control has remained elusive. Games have to be programmed to support the new device, of course. 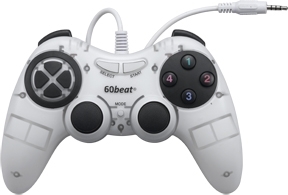 At present only 2 games support the 60beat GamePad, but a “full collection” of supported games are said to be added in February 2012. The GamePad is priced at $49.99 with supported games sold separately. Lion [10.7] Dual or Triple Booting? Mac OS-X Snow Leopard, Lion and Windows?